I am really happy to be going north to my original home town, Maryborough, this coming weekend (June 2 – 3) for the annual Relish Festival. The lovely Trevor, from Gatakers Artspace has invited me back for another day of bringing paper making to the public. 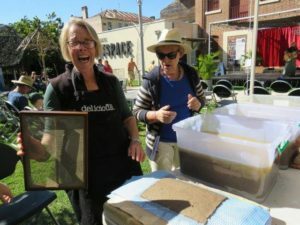 Last year we introduced a lovely group of people from France to paper-making, as well as some adventurous locals. 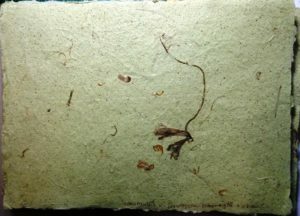 As the intention is to use plants which are also used as food or flavours, this year I have prepared two batches of botanical paper pulps. The first uses lemon myrtle, a local native tree (Backhousia citriodra). This batch uses some recycled office waste and quality cotton linters, along with lemongrass stalks and dried ground lemon myrtle which gives a delightful green speckle. Unlike some pulps which can be a bit stinky, this one has a lovely lemon aroma. 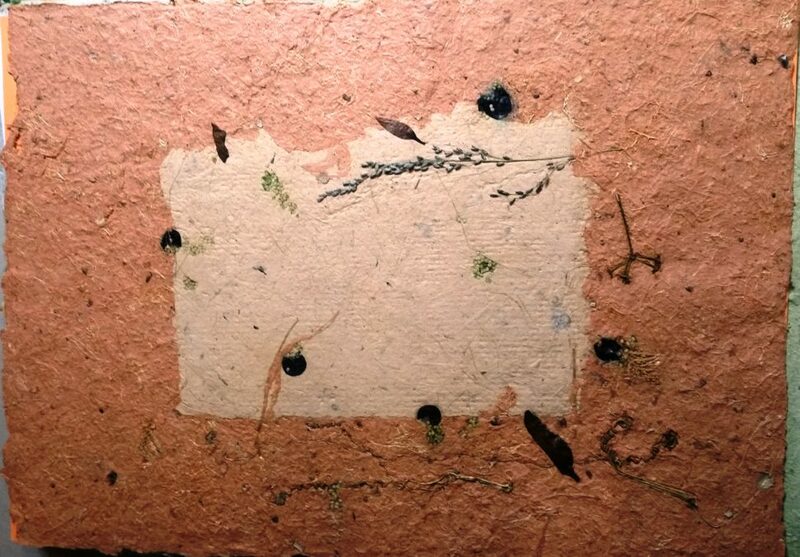 I have experimented with couching some sheets of this paper using some inclusions of native flowers, generously donated by native florist, Eugene Bargo. The second vat will have pulp from galangal, (Thai ginger) with added fibres from hibiscus species including rosella and okra. 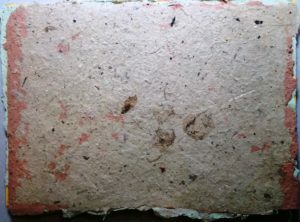 Additions of office waste and cotton linters and a dash of kaolin, starch and whiting should make this a lovely paper to work with, however I haven’t had a chance to couch and dry any sample sheets yet. What I did play with was loofah paper! This year I am lucky enough to have a bumper crop of loofahs, those climbing vines with large, pendulous fruits which are natural scourers. They grew near the compost heap which may account for the remarkable vigour and productivity of the vines. Some started to rot on the vine so I reminded myself that it isn’t just stalks which can have strong fibres and make paper. In the case of loofahs, the fruits can do it too! It was such fun playing with the Loofah vines that I also collected many of the curly tendrils by which the vine climbs up nearby trees and fences. After 2 hours of vigorous cooking the whole loofahs, including skins and seeds, were blended with art scraps and warm-toned office waste. 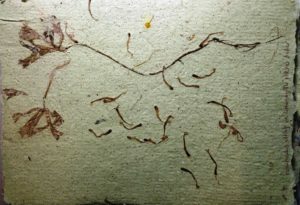 The curly tendrils were also cooked. 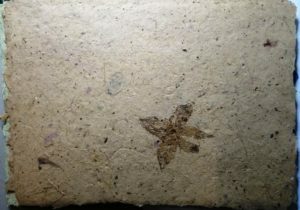 Several sheets of loofah paper were couched and decorated with seeds, tendrils and other loofah-related insertions. On our Sunday morning walk I also collected some black nightshade berries growing wild by the footpath which have given a strong purple-blue when used as inclusions. 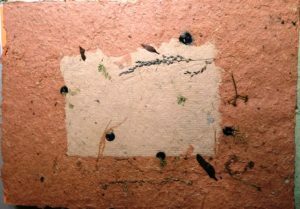 The paper shown below has been laminated: two sheets couched onto one another. 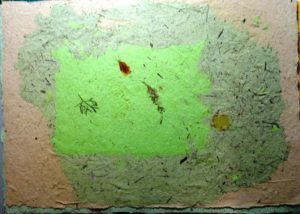 The top side shown here is the gooseberry lantern and arrowroot paper, with the orange warmer tone of the loofah paper showing through around the edges. Thanks for reading about my experiments, I hope they inspire you to try things and share your results! Another experiment concerns gooseberry “lanterns”. During days observing the gentle habits of the garden, I often notice skeletonised “lanterns” in the garden under the Cape Gooseberry bushes. They are the papery cases around the yellow fruits. I formed an intention to try paper from them, but although it took me a long time to accumulate enough for a batch, I finally did it!